If you like Ranma, Urusei Yatsura, Inu Yasha, Maison Ikkoku or Rumic Theater you're in luck. The latest Rumiko Takahashi work has just been made in to an anime series. The first episode seems to have things off to a good start, with decent comedy and animation. 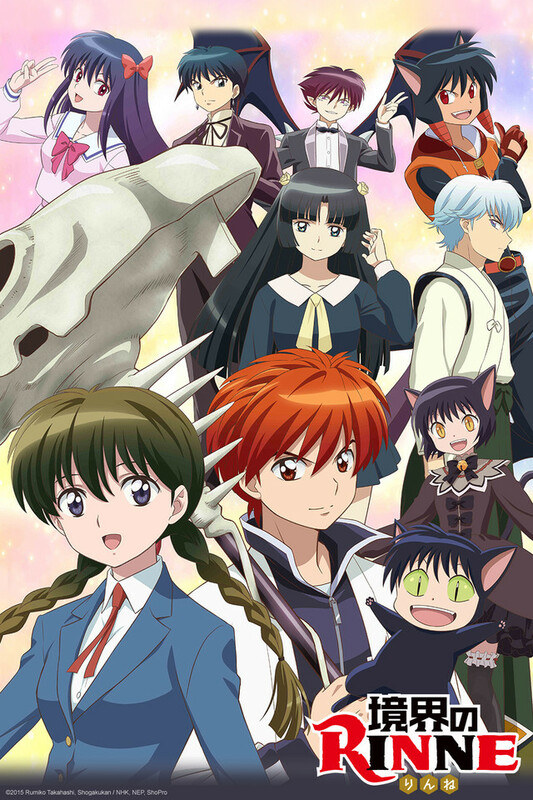 Rokudo Rinne and his strange friends are here! Partly out of boredom, and partly because I love manga, I started reading this series last winter. I got caught up to around chapter 200 or so (which would result in about 100 episodes). Whether this show gets that many seasons remains to be seen. Rin-Ne is an anti-shounen shounen show. Does that make any sense? Invariably, there are conflicts between the protagonists and spirits who can't move on. But these conflicts play out in a powered-down fashion, often involving expensive spirit items (and they always tell you how much yen something costs). The show features a poor high school student named Rokudo Rinne, who describes himself as a human "sort of thing." He divides his time between removing curses from other students, sending spirits into the Wheel of Reincarnation, and feeling sad about all the free stuff he doesn't get to keep. The story is less about spirits and more about what money (or lack thereof) can do to people. It's just not another Shinigami story- there's much more to it than that. Rumiko Takahashi has outdone herself yet again. It feels like Ranma 1/2 & Inu-Yasha somewhat wrapped into one story! It has the magical world feel of Inu-Yasha yet it is mostly based in the real world high school setting that has the Ranma style hijinks involved! The animation is beautiful, great voice actors, I love the soft spoken, spacy style of Mamiya. Having read the Manga, I love how the story is unfolding upon my very eyes! This show makes me want to revisit the older Rumiko classics! Then please watch this anime! It starts out kinda slow but by the third episode I was hooked. I'm a sucker for anything Rumiko Takahashi has to offer and RIN-NE didn't disappoint. Now if they would only finish animating Ranma...but I digress. Give this a chance! I'm actually liking this anime a lot! It's funny and quite sweet in certain parts. It can get pretty serious but there is always comedy involved. Rinne's obsession with money borders with reality (put yourself in his shoes, you're 15 years old and alone with nobody to help you, wound't you constantly be worried about money?) Well all in all it's a very enjoyable show. If you love comedy you definitely should watch this show! I absolutely adore Rumiko's works such as Ranma 1/2 and Inuyasha. This gives me that same happy vibe that her older series gave me but with new modern, crisp animation. The manga series for this is excellent and the anime so far goes beyond my expectations! 5/5! I personally loved the first episode of this and can't wait for more. Yes its bit random but thats what makes shows like this and other materials by Rumiko Takahashi (Ranma and Inuyasha to name a couple) so perfect. They are random yet still manage to tell a story. I am very interested to see where this one goes. I love the show but it has one glaring flaw that all of Rumiko Takahashi stories have. Many shows have the same problem (I'm looking at you Case Closed) It is a good show just with flaws that could make it better. The show early on has character development while seeming borderline episodic at times. But after the first few episodes, you can start see the bigger picture taking shape, with the larger conflicts being laid out. I definitely recommend the show, but don't be dissuaded if it seems like it is building too slow in the first few episodes, because it does gain traction, leaving you wanting more.